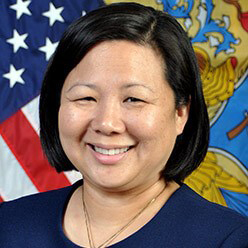 Lisa J. Hou, was appointed in February 2018 as the Deputy Commissioner for Veterans Affairs. In this capacity, Hou administers two Divisions that serve New Jersey Veterans. In addition, Dr. Hou holds the rank of Colonel serving in the New Jersey Army National Guard in the dual roles of commander of the Medical Command and the State Surgeon. In those capacities, Deputy Commissioner Hou is responsible for the medical and dental readiness of more than 6,000 Soldiers.